Imagine if you were the first and only female police detective in Acapulco, investigating crime in a city both breathtaking and deadly. Mexican drug cartels battle for control and politicians are bought with blood money. The detective squadroom reeks of machismo. The lieutenant is a dirty cop who has trapped you into silence. 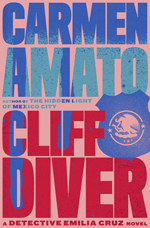 That’s the situation for Detective Emilia Cruz in CLIFF DIVER, the first book in the sensational police procedural series taking the mystery scene by storm. Unexpectedly put in charge of the investigation when her lieutenant is found dead, Emilia uncovers the lieutenant’s sordid sexual past as well as his role in a kidnapping double-cross and counterfeit money scheme. Feeling like one of Acapulco’s famous cliff divers hoping not to crash on the rocks below, Emilia must choose between truth and survival. But no matter what choice she makes, she won’t be ready for the shock of the water.